LA PORTE COUNTY, Ind. (WLS) -- The La Porte County Sheriff's Office is asking for the public's assistance with a littering problem in the rural Galena and Springfield Township areas. Approximately seven months ago, sheriff's deputies say they began noticing an increasing amount of white plastic bags being dumped along roads in the two townships. The bags, which were described as typical grocery bags, contained soiled diapers. They have been found along CR 125 E, CR 800 N, CR 900 N, Fail Road and CR 1000 N, deputies said. 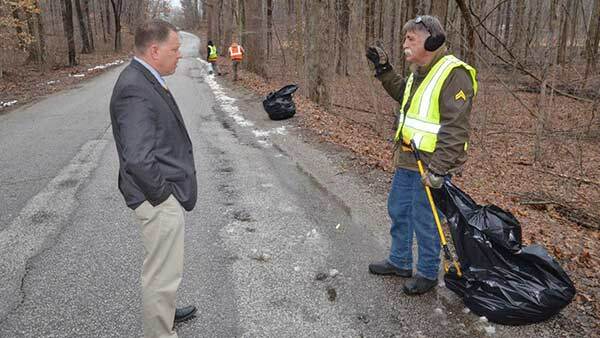 On Wednesday, the Community Work Program crew from the La Porte County Sheriff's Jail began a cleanup of the trash left behind during a long winter. "It's sad that in the short time they've been working, the truck is already full of extra large bags holding all of this trash," Sheriff John Boyd. The sheriff says citizens who see continued littering the areas are asked to call the sheriff's office or even call 911. Police say the diaper pose a public health risk. Boyd also offered praise for the efforts of the community work program officers and inmates that spent a day to remove the trash.